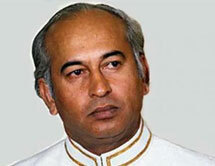 Pakistan Peoples Party Parliamentarians (PPPP) was founded by Zulfikar Ali Bhutto. Find Pakistan Peoples Party Parliamentarians (PPPP) PPPP Detail Election Results 2018, national assembly Seats, Sindh, Punjab, Balochistan & Khyber Pakhtunkhwa KPK, FATA, News, Candidate names, Pakistan Peoples Party Parliamentarians (PPPP) PPPP Party Contact Information, Party Flag, Logo & Songs. In 2002 Pakistan's current president, Pervez Musharraf introduced a new amendment to Pakistan's constitution, banning prime ministers from serving more than two terms. This disqualifies Bhutto from ever holding the office again. This move by people who were themselves on shaky democratic ground, was widely considered to be a direct attack on former prime ministers Benazir Bhutto and Nawaz Sharif and exhibits the military establishment's insecurities about its own political power.Bhutto is currently (as of September 2004) based in Dubai, United Arab Emirates, where she cares for her children and her mother, who is suffering from Alzheimer's disease, and from where she travels around the world giving lectures and keeping in touch with the Pakistan Peoples Party's supporters.Benazir and her three children (Bilawal, Bakhtawar and Asifa) were reunited with her husband and their father in December 2004 after a period of more than five years. Bhutto has vowed to return to Pakistan and run for Prime Minister in the next general elections scheduled for November of 2007.